This past Thursday, Team Pengyou was inside the Benjamin Franklin Room at the US Department of State witnessing the launch of the new 100,000 Strong Foundation. This past Thursday, Team Pengyou was inside the Benjamin Franklin Room at the U.S. Department of State to witness the launch of the new 100,000 Strong Foundation. 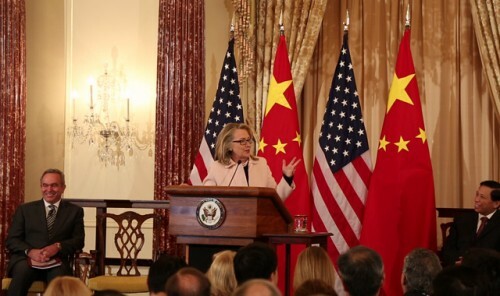 The guest of honor was Secretary of State Hillary Clinton, who, after a grueling session at the Benghazi hearings just the day before, made it out to announce the launch of the foundation, signaling her personal commitment to strengthening U.S.-China relations through student exchange. Carola McGiffert, who will be president of the new independent foundation, sat in the front row along with other important figures including our very own board member Chris Cooper of Deloitte, who also sits on the board of the new foundation. The Ford Foundation is providing $1 million to set up the new foundation as a public-private partnership, and in addition will be supporting Project Pengyou with a significant grant to mobilize online and offline community networks from the bottom up, thus complimenting the efforts of the new DC-based foundation. 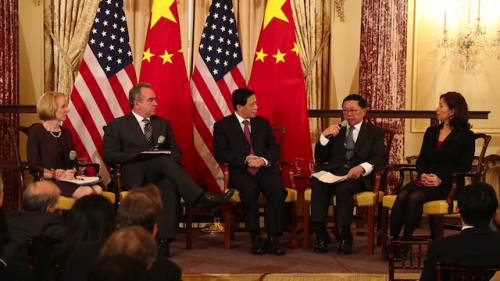 Following Secretary Clinton’s remarks, a panel of U.S.-China experts discussed the U.S.-China relationship and how we can strengthen ties between the two countries through people-to-people exchange and study abroad. – Zhang Yesui, China’s Ambassador to the U.S.
During the panel, our board member Henry Tang, as well as Nancy Yao Maasbach, gave a much-appreciated shout out to Golden Bridges and Project Pengyou, emphasizing the important role of programs and young Americans on the ground championing the missions of 100,000 Strong. Henry Tang spoke of a study conducted by the Committee of 100, surveying 5,000 people in the U.S. and China. While perceptions between Americans and Chinese are improving, there is still much public fear and distrust that underscore the relationship. We are hopeful that the national campaigns planned by the new 100,000 Strong Foundation can make significant strides to strengthen relations. We were pleased to see so many old friends at the launch event, including representatives from Teach for China, The College Board, American University, Morehouse College, Institute of International Education, Americans Promoting Study Abroad, Global Maximum Education Opportunities, the Yale-China Association, and the Committee of 100. We know firsthand that these organizations are led by passionate Americans who have been driving the missions of the 100,000 Strong Initiative since before President Obama visited Shanghai for the first time to announce its launch. Later that night, we attended a VIP Reception inside the beautiful home of Ambassador Zhang Yesui, where we also heard from Florence Fang, who offered moving remarks explaining why she has decided to match the Ford Foundation’s donation of $1 million to the 100,000 Strong Foundation. With the launch of the new foundation, we are excited to bring on an important partner to help us meet the challenges ahead and bring about a more functional and peaceful relationship between the U.S. and China. 100,000 Strong 万岁! Are Hillary Clinton’s China ties behind a dropped espionage investigation?